FlyDealFare delivers you the best deals and offers cheap flights to Hyderabad from the US. With us, you will discover the best customer service and inexpensive fares available on all the major airline carriers. Get in touch with our team today and they will book your flight to Hyderabad on the date you wish to travel without burning a hole in your pocket. The delightful city of Hyderabad is something you would imagine it to look like having narrow streets filled with people busy shopping from local market stalls, tea shops, rickshaws commuting people, traffic with horns honking, old Mughal architecture and rich colors. Hyderabad has witnessed two exceptionally rich royal Muslim houses that have left behind a legacy of majestic religious architecture and royal palaces. Hyderabad has seen a boom in the field of IT industry that emerged in the 1990s which have attracted many youngsters to this city. It resulted in the inception of trendy glitzy malls, night-clubs, multiplex theaters, bars, and pubs. The new Hyderabad has managed to maintain its old self as you will notice lots of traditional teahouses and world-famous biryani shops still enticing quite a lot of crowd. Every traveler that comes to this Pearl City leaves with a big smile and an unforgettable experience. The experience is simply enthralling because of its sheer grandeur. Charminar, an architectural marvel that has withstood the test of time for over 4 centuries, the Golconda Fort is another captivating example of the royal lifestyle of Hyderabad just like the Mecca Masjid that was built using bricks brought in from Mecca. The list is long of the places to encounter in Hyderabad with places such as Salar Jun Museum, Zoological Park, Hussainsagar Lake, Birla Mandir and many more. Your trip to Hyderabad will be pointless if you are unable to shop silk Pearls, Sarees, and other rare jewelry. You can purchase colorful bangles from roadside stalls in the evening and conclude your day enjoying the fascinating sights and sounds. 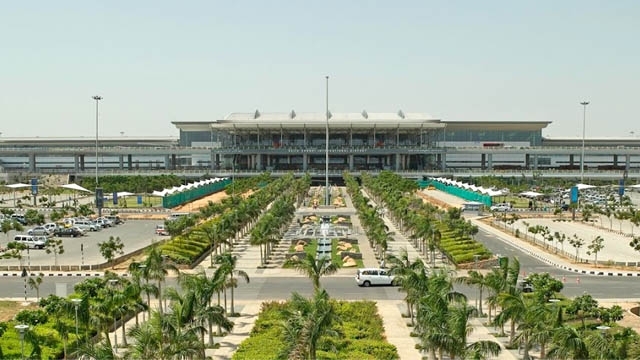 Rajiv Gandhi International Airport is also known as the Hyderabad international airport. It is located in Telangana (the newest Indian state). Being operated by GMR Hyderabad International Airport Ltd, it was opened in the year 2008. The name of the airport is taken from former Prime Minister of India, Rajiv Gandhi. There are one passenger terminal, a cargo terminal and two runways at the airport. In addition to that, you can also find aviation training facilities, a solar power plant, two MRO facilities and a fuel farm here. Currently, it is considered as the sixth busiest airport by passenger traffic in India.